Did you know getting your seasonal flu shot can help save lives? 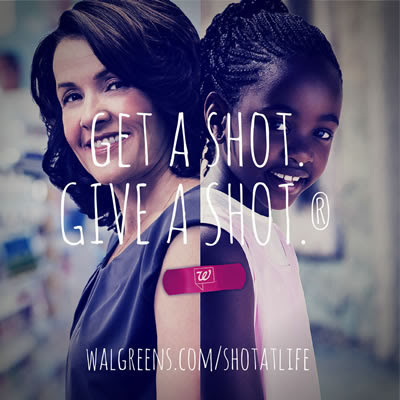 Thanks to a partnership between Walgreens and the United Nations Foundation’s Shot@Life campaign, getting your flu shot means a life-saving vaccine will be given to a child who needs it most. Now Through October 13, when you receive a flu shot or any other immunization at Walgreens through the Get a Shot. Give a Shot. ® campaign, they will help provide a vaccine against polio or measles to a child in a developing country through Shot@Life and our United Nations partners. Take the pledge to get your flu shot or any other immunization at Walgreens. You can easily visit a local pharmacy, hospital or doctor’s office to get your immunizations, but millions of children in developing countries don’t have the same opportunity, leaving them vulnerable to devastating diseases like polio and measles. In fact, a child dies every 20 seconds from a disease that could have been prevented by a vaccine. You can help change a child’s life forever. We have taken the pledge to Get a Shot and Give a Shot…how about you?? Join others to make a world of difference. Visit Walgreens to get a flu shot and give a shot that will protect a child from a harmful disease.